Conceptualized by the Millennium Hotels & Resorts, Studio M Hotel is the first hotel in Singapore with all its 360 rooms as loft rooms. That being said, Studio M Hotel offers a variety of rooms for you to choose from. The Studio Loft is their basic and most affordable room, with prices starting from S$195 per night. At the size of approximately 22 square metres, this duplex Studio Loft has an extremely modern design with a touch of minimalism. M Social is a designer hotel that was brought to life by the design of Philippe Starck, who sought to create a space where people could meet and grow together on the strong foundations of friendship and learning. 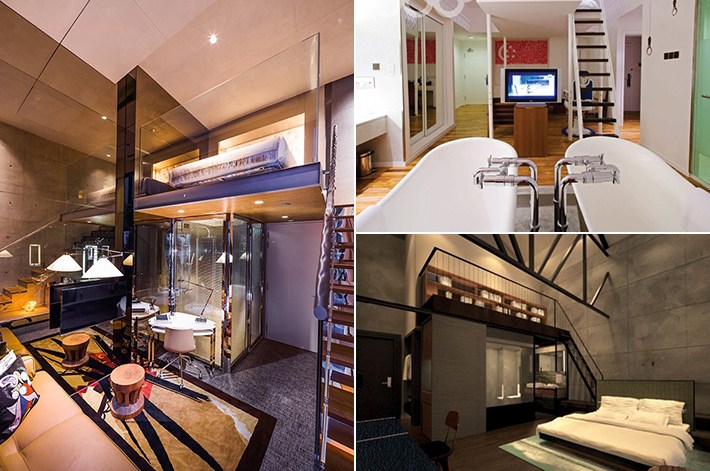 Three different types of loft rooms await you at M Social, namely the Loft Gallery, Loft Premier and Loft Terrace. Amongst the three, the Loft Gallery is the most affordable, with prices starting from S$225 per night. Featuring bay windows and a 40-inch HDTV with Bluetooth integration and cable channels, look forward to a well-rested break. Wanderlust Hotel is yet another popular option if you are looking for loft rooms! Nicknamed “Creature Comforts”, the top floor of the Wanderlust Hotel has 9 loft rooms based on 5 varying themes, namely ‘Bling’, ‘ACSII’, ‘Space’, ‘Tree’ and ‘Typewriter’. Slightly larger in size than the loft rooms in the Studio M Hotel and M Social, the loft rooms in Wanderlust Hotel are approximately 26 square metres in size. The loft rooms in Wanderlust Hotel are also equipped with a comfortable Sealy Posturepedic queen-size bed for sweet dreams. Prices start at S$199 a night, and includes a free daily breakfast and an in-room Nespresso selection. Lloyd’s Inn is one of the most Instagrammed hotels in Singapore. From regular #ootd shots to serving as a filming location for various shows, this is a testament to how stylish and chic the hotel is. Focussing on the elements of nature, space, light, texture, convenience and comfort, Lloyd’s Inn seeks to provide its visitors with a place to escape their busy life, and to indulge in a time of reflection and self-realization. The loft room—Lloyd Inn’s Big Skyroom (prices starting from S$268)—is to die for. Walk through the glass door to find an outdoor bathtub where you can soak comfortably in and just watch the world go by. Or simply take a seat on the beautiful white stairs and disappear into your daydreams. Situated in the Central Business District in Singapore, Dorsett Singapore Hotel is known for its modern, innovative and comfortable concept. As with most other loft rooms, work and rest areas are separated by a mezzanine level in this 25 square meters room. Dorsett Singapore Hotel’s loft rooms are also equipped with a King Size Sealy Posturepedic mattress, and the room also has a 40″ LED Television, with plenty of International and Cable TV channels for you to browse through, as you relax and unwind in this clean and modern loft room. A unique loft room experience awaits you at the New Majestic Hotel. There is a staircase (or rather, a ladder) in each of the three Attic Suites that leads you up to the sleeping area. The star of this room would have to be the dual his-and-hers vintage cast-iron bathtubs. How often do you see two bathtubs in one hotel room? And that they are also placed side by side? Now, that is definitely one intimate experience that you will be sharing with your partner. You will be entitled to complimentary non-alcoholic drinks from the mini bar as well as bathroom amenities from Kiehls. Room rates start from S$399 per night. The Warehouse Hotel is a new boutique hotel in Singapore that has a plethora of loft rooms, and the room to look out for is their River View Mezzanine. Apart from its duplex floors, what makes the River View Mezzanine so special is that it offers all visitors their own reading library, as well as a view of the Singapore River to enjoy while enjoying a good read. Prices start from S$475 per night, and the rooms would make you feel like you have stepped back into the old industrial era as this room. This room is also extremely spacious at 45 square metres and is equipped with a Bang & Olufsen Bluetooth speaker. If loft hotels are not for you, why not check out 15 Romantic Staycation Ideas In Singapore For Valentine’s Day to get some ideas! The New Majestic Hotel looks nice and awesome. Their simplicity draws out their beauty.